One-touch Front/AUX camera view with auto-off *. Includes standard lug mount and Hyundai/Kia adapter. Remote control for accessing built-in functionality. Dual RCA video inputs with individual triggers. 9-foot video cable provides easier connectivity. 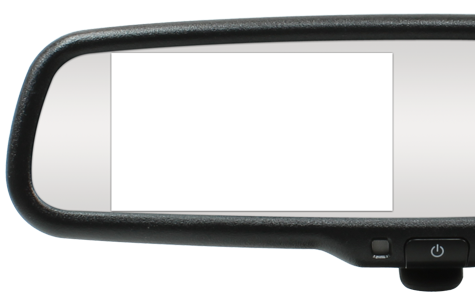 The Quick Touch button built into the face of the 250-8208 mirror has different functionality available depending on the state of the vehicle. A. When in reverse, a quick press of the power button will manually increase the overall brightness of the built-in LCD screen. Once maximum brightness has been reached, the brightness will reset. B. When the vehicle is not in reverse, the power button can be held for two seconds to display video from an auxiliary camera such as a forward-facing or blindspot unit. 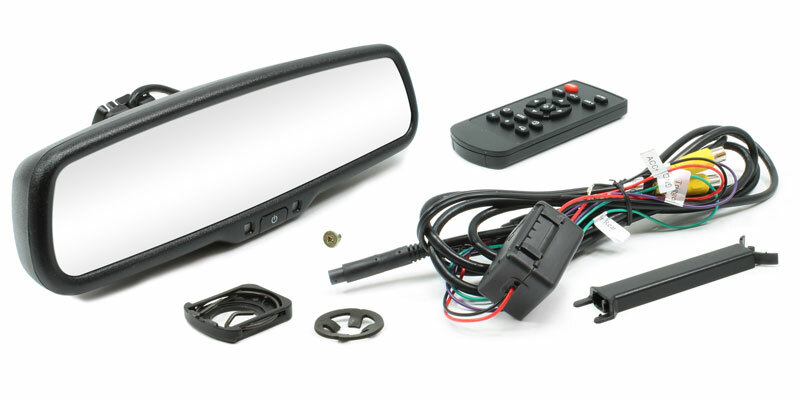 The 250-8208 installation kit includes the LCD-equipped rearview mirror, power/ground/video harness, IR remote control for adjusting the on-screen display, wire cover, standard D-shaped mounting lug, and Hyundai/Kia lug adapter. 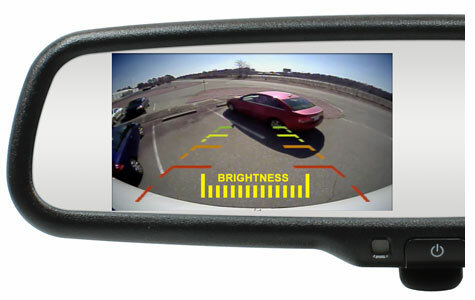 The 250-8208 mirror features on-screen parking assistance grid lines to aid drivers when maneuvering the vehicle in reverse by helping to provide an estimated distance to any objects in view of the backup camera using color-coded zones. The remote control included with every 250-8208 mirror allows installers and vehicle owners to make vehicle-specific adjustments including turning parking assistance grid lines on or off as well as aligning the grid lines on-screen for increased parking accuracy. At Rostra, we are proud to carry both ISO 9001:2008 and TS 16949:2009 certifications. Our in-house testing facilities allow us to simulate extreme real-world conditions including tests for operation at hot and cold temperatures, along with ingress protection (IP) and vibration. Rostra parts go through hundreds of hours of testing in our lab environment before being made available to our customers. For the best in driving experience, choose a RearSight® backup camera system for your vehicle from Rostra, the leader in vehicle comfort, safety and security. Please note, RearSight® camera systems are only sold through authorized distributors. Please contact Rostra to locate a distributor in your area.